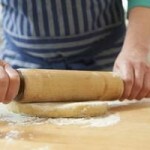 Roll out the pastry on a lightly-floured surface to about a 11 ” (28 cm) circle. Wrap it around a lightly-floured rolling pin and lower into a 10″ (25 cm) round pie dish. 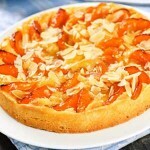 Press the pastry into the dish and flute or crimp the edge with a fork. Prick the base lightly with the tines of a fork. Combine all the filling ingredients in a mixing bowl and beat with a mixer until smooth. Pour into the pie crust and bake in a pre-heated oven at Gas Mark 7 (220°C/425°F) for 10 minutes. Lower the temperature to Gas Mak 4 (180°C/350°F) and continue to bake for a further 40-50 minutes or until the filling is set. Nice if decorated with a circle of pecan halves. This pumpkin pie is lovely warm or cold with some whipping cream. Don’t forget the recipe calls for 1 lb of cooked and mashed pumpkin, not a pumpkin weighing a pound. Hi Val, what’s a Fleur pastry? is regular old shortcrust pastry ok? 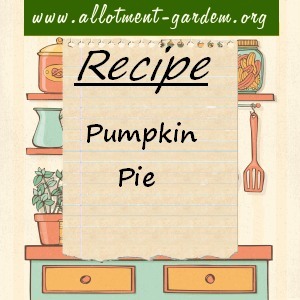 I’m looking forward to trying this – it’s been years since I had pumpkin pie and the garden’s given us 6 pumpkins this year.